What happens when four Canadian recording artists with strong musical influences from four different cultures, reinterpret each other’s songs? Cover Me Globally is a unique exploration of how songs can cross genre, culture and language. 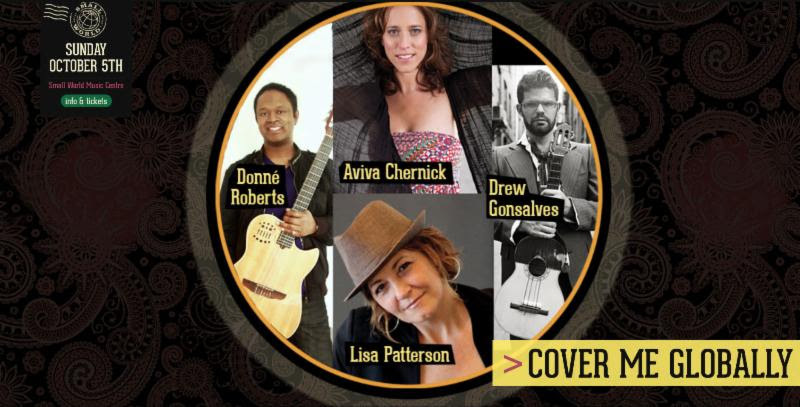 Award winning world music singer /songwriters Drew Gonsalves (Kobo Town), Aviva Chernick (Jaffa Road), Donne Roberts (African Guitar Summit) and Lisa Patterson (Roam) step away from their bands and into an intimate and interactive song exchange with each other. These four world music songwriters with influences from Caribbean, Jewish, African, European traditions will also each cover a Canadian Popular Classic of their choosing. From Joni Mitchell to Drake, it’s all possible!